Sometimes great ideas shine, just because of their simplicity and I think I had one the other day. (You can tell that I am modest person :-). I am claiming to have the most sophisticated aiming system of any pneumatic antenna deployment apparatus out there. 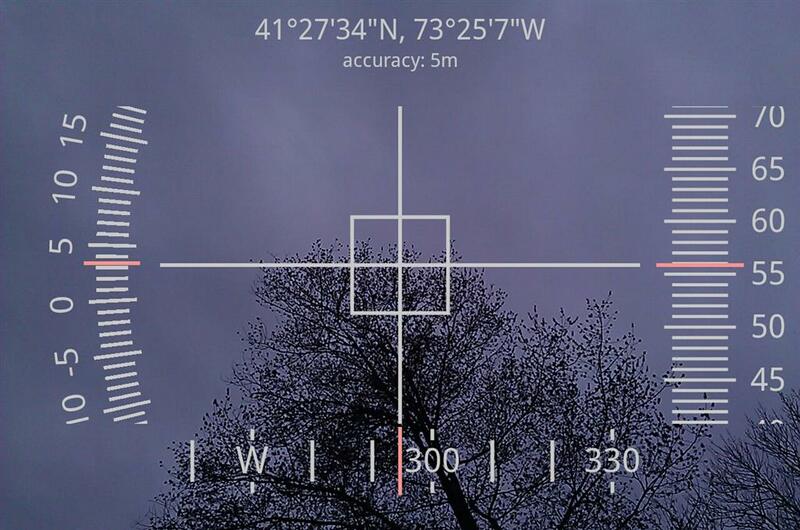 Here the Head Up Display of my "Augmented Reality Digital Scope". aiming at 56 degree up at a tree-top in my front yard. The scale for pitch (gun barrel angle) is displayed on the right. The Scope mounted on my "steam-punk" antenna launcher. I know! The mount of the scope should have been made out of wood. Front view. The Scope mount is attached with Velcro tape to the barrel for easy installation. Calibration of the scope is possible while mounted but it can be performed before installation on a perfectly level surfaces for greater precision. This is the Scope's quick mount. I fabricated the mount out of aluminum L-stock. A piece of scrap 4" PVC pipe was used for the bottom part. I softened the plastic using heat-gun and formed it to fit tight around the 2.5" barrel. Small Velcro straps are used to secure the instrument in place. It takes about 30 seconds to install or remove the actual scope . Ta-Daaah! Here is the secret :-))) The Scope is actually my Android OS smart-phone and it cost me absolutely nothing :) (I already had the phone). That's why it was important for me to be able to easily install and remove the phone from the mount. I fabricated the mount to fit my specific model phone - T-Mobile G2 (HTC Desire Z) but it can be modified for any phone. Another view of the mount. Note the little cut-out for the phone's digital camera. The construction is very light and sturdy. The phone has a gel-skin to protect and further enhance the mounting. The heart of the aiming system is a free app called GeoCam v.2.07, available on the Android Market or it can be DL from here. I came across this app accidentally and my first thought was - this could be useful for something one day (it used to be called Theodolite). It displays a wealth of information and it can triangulate objects in order to measure distance and height. The phone's accelerometer sensor is used to measure pitch (essential!!) and roll (the roll is kind of useless for the aiming system). It is using the internal magnetic sensor for the heading (compass) and GPS receiver for coordinates. All this information changes dynamically and it is super-imposed over live video image from phone's digital camera. One can adjust colors of the HUD data and control the iris (exposure compensation) - very useful for use in bright, sunny day. (I am thinking of making some sort of rigid hood for the display to enhance further the contrast in bright ambient light and reduce glare). There is also a nice calibration procedure - very useful to account for differences between each installation. The output will be a firing solution - Angle and required Muzzle Velocity. The tricky part will be to establish the correlation between the air tank pressure and the initial velocity of the ball leaving the barrel, but I'll work on a way to figure it out (police radar?). For the muzzle velocity you could use ir sensors put at a certain distance inside the pipe (in the walls) and etablish the speed, you start a timer when the ball hits first set of sensor/emiter and stop it when it hits the second pair. after some simple math you have the speed (distance/time). You may want to take Rosu Vlad's Idea and expand on that using the ioio device from sparkfun electronics. You can make a simple chronograph to calculate muzzle velocity. Could probably also wire up a pressure sensor for the tank, and still connect it all to your android phone. Yep. One can build a fixture to measure the muzzle velocity. Also there are used police radars sold on eBay. After I used the antenna launcher for awhile I found out that I can get the desired trajectory in up to 3-4 attempts max (average 2 - dry tests with just a ball and no line) thanks to the digital scope. In theory, the balistic solver should make it one-shot deal but there are other factors - precision of the pressure gauge, wind, accuracy of measuring the height, etc. At the end of the day, I had the feeling that such scientific aproach would be over-doing it and if I didnt have anything better to do, I could get carried away with making it the ultimate antenna launcher. As for the bike mount, yep - I am sure there are other very easy solutions out there. I even looked at a few phone car mounts (after I made my own) The reason I fabricated my own mount is that I tend to work on my projects late at night, and when I get an idea - it is already too late to go out shopping - instead I try to finish it with what I have in hand.